The battle for Stalingrad took place between August 2nd 1942, and February 2nd 1943. The capture of Stalingrad was important to Hitler for several reasons. It was a major industrial city on the banks of the Volga River and its capture would secure the left flank of the German armies. The fact that the city bore the name of Hitler’s nemesis, Joseph Stalin, would make the city’s capture an ideological and propaganda coup. However, ravaged by heavy bombardments and brutal battles, soviet snipers successfully used the city's ruins to inflict heavy casualties on the Germans. Vasiliy Grigor´yevich Zaytsev was credited with 242 kills during the battle. The victory at Stalingrad marked the start of the liberation of the Soviet Union, leading to eventual victory over Nazi Germany in 1945. It is late autumn of 1942. You are a highly-praised soviet sniper. 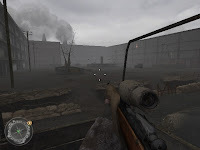 Crawling through the city's underground, creeping through ruins, jumping from one building to another, and engaging in close quarters combat as well as long-range shooting, you must make your way across part of Stalingrad. Around every corner is either friend or foe. Your objectives are to gather intelligence, eliminate high-ranking officers and enemy snipers, and provide covering fire for your comrades as they pursue their own objectives to recapture lost ground. Just less than two months after release of a first soviet campain called Leningrad the 'brothers team' come back with another russian and snow experience drawned in a totally other way, this time it's not a rush with you team but more a hide and progress mission. 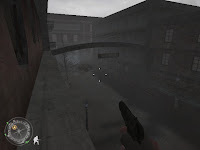 Design and architecture tend to be more developped than in Leningrad, trying to create a city ambiance full of trap and ambushes where progression is linked to head shooting, from simple soldiers to main officers (part of the objective to be completed). I insist on the first line were i tell 'tend to be more developped' because talking about the architecture is still the weakest part from babycop (but i would be so pleased to map like them...): the sewer make me more think to a maze where you loose time than to a real russian sewer full of broken path, water and garbage. After the german intense bombing Stalingrad does provide a lot of house with roof and sewer that isn't even destruct in some part which make it not as realistic as Beyond Rostov mission pack for CODUO. You will also cover one of you team mate that will destoy trains (this train garage is way to boxy and unhopened), to reach finally after a small truck ride (highly enjoyable but not realistic at all like if Stalingrad was build has a maze, looking through the path of the truck, and not like all other town all over europe with normal crossings an unlinear roads)that will reach a main place where you will need to resist to a counter attack before and end surpise that was well imersing the player. The ambiance is one time more well created not a lot of sounds not so evident to find your way for the first couple of the map (till you kill the first officer) and scripting was for me the highlights of this mission. It is also important to mention that some custom music has been added, like in Leningrad, and well played through the map. In conclusion: I have really a mixed feeling after playing this release, it was a good follow up of Leningrad that even if it was more basicly build had a magestrous filling of rushing team with perfectly feeting music through the russian fields. In this one attention has been put through objective to a more calm experience (except the counter attack) in a huger architectural effort that tend to be more challenging to the team, trying to recreate a russian city battle. In my opinion Stalingrad didn't left me the same feeling at the end as Leningrad and this even if it was more polished. It cetainly is a great experience but after Leningrad my expectation where higher.